Try eating these muscle building foods if, well, you want to put on muscle! They are healthy and tasty, in addition to giving you the protein and other nutrients you need to build muscle. I've chosen real foods as opposed to supplements or powders. This is because real foods give you the nutrients that you know you need, as well as others that you might not think of - but that will help you. Milk is the king of muscle building foods. It's pretty cheap, it gives you lots of energy, it's easy to drink a lot of if you're trying to put on weight - and it's my preferred post workout drink, since it has protein and carbs. Milk has a long history as a muscle builder. It's a cornerstone of the 20 rep squats routine, and it's great for adding muscle in general. Salmon is mostly protein, giving you fuel for your muscle building. It also has lots of cool omega 3 fatty acids which, aside from generally being healthy and bringing down inflammation, may provide specific benefits for building muscle. 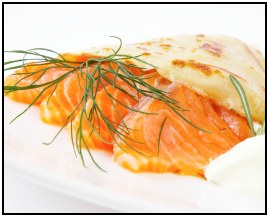 Smoked salmon is a great way to get salmon on the run. You don't need all the cooking time of a piece of raw salmon, and you can add smoked salmon to just about anything. Mmmm… Eggs! These guys are chock full of protein and healthy fats. And to put on muscle, add some more egg whites to your diet for the protein. On top of that, they're versatile and tasty and cheap! Omelets, eggs over easy, or mixed in with a stir fry - they're easy foods that build muscle to add to your diet. Another great source of protein, turkey breast is cheap and can be served a variety of ways. If you're in a hurry you can add it to a sandwich - try adding almond butter to the sandwich for a tasty and muscle building meal. Together, rice and beans make up a complete vegetable protein. And the carbohydrates in the rice will raise your insulin when you eat them, helping to build your muscles like a well constructed post workout drink. Sausages are a surprisingly versatile food. They can be prepared a variety of ways, keep well, supply you with protein for muscle growth, can be speedily prepared and eaten, and taste great. I mostly like them because they have protein, and they are easy to add to almost any meal or to prepare on their own. If you're looking for something sweet, try sautéing them with onions, apples, and cinnamon. If you're going pure savory, just add come cayenne pepper. Eating to get big muscles doesn't have to be boring eating, even on a budget. Delicious red meat that will become muscle! In addition to supplying you with protein, beef also has a high iron content, naturally occurring creatine, and (if it's grass fed) even omega 3 fatty acids. One downside is that it takes a while to prepare. Still, a grass-fed roast beef sandwich or salad after lifting will work great. High in protein, easy to prepare, and easy to eat quickly after your workout. Need I say more? This is one of my favorite foods for putting on muscle. Try adding some lemon juice to it for some added kick and taste. Or, chop in some bits of pineapple or papaya for sweet carbs. Almonds and almond butter are great food for building muscle for several reasons. First, they have a higher protein content than other nuts do, and second they're mostly fat so they have lots of energy. Also, almonds are very easy to transport and eat. You can add them to sandwiches, shakes, or virtually any meal easily by just scooping some out of the jar. While not technically a food, getting enough water is vitally important. For absorbing nutrients in your muscle building foods, for muscle contraction, and for staying healthy. No matter what muscle building foods you choose, drink a good amount of water with them. Hydration is important for exercise and muscle building. While some supplements can help you towards your muscle building goals (a multivitamin, creatine, etc. ), most are rubbish. The real muscle building foods are real foods. Aside from just generally giving you fuel and protein, you're used to eating real food. It's what your body was made to do, not to extract protein powder from expensive drinks. Getting your daily protein intake should be your primary focus. If you have the option of choosing from these foods, great! If not, at least make sure that you get your protein. And remember that effort is as important as food! Even if you're eating the best muscle building foods, without a good workout you will not put on muscle. 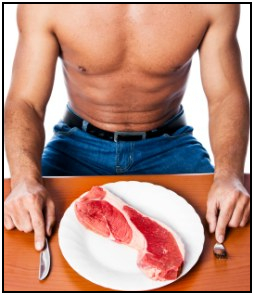 • Click here to leave '11 Top Muscle Building Foods' & go back to the Home-page!